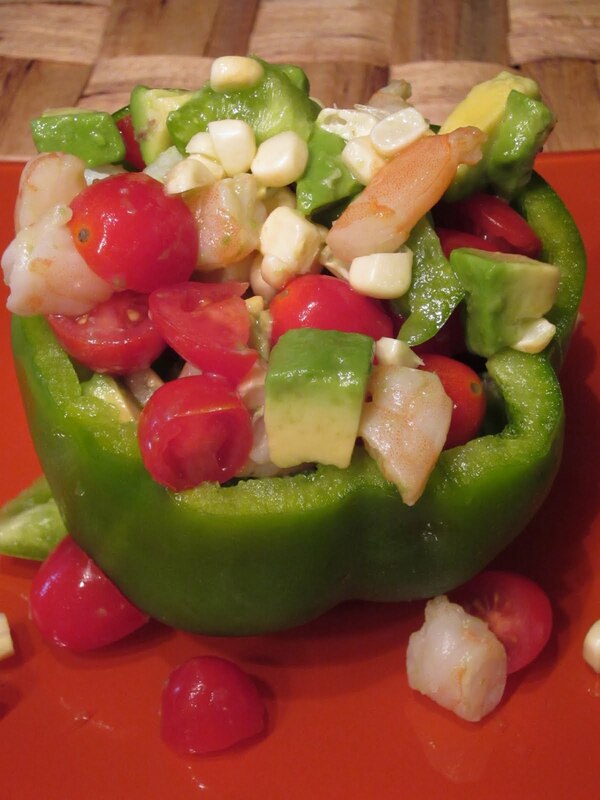 One More Taste: May 25 Salad: Bell pepper bowl? May 25 Salad: Bell pepper bowl? Who needs lettuce? Not me, not today anyhoo. I got my green on in the form of a raw, crunchy bell pepper (stem and seeds removed) stuffed with shrimp meat (squirted with lime juice), fresh corn, cherry tomatoes and diced avocado, with some of the red pepper vinaigrette I made the other night for kicks. The bell pepper might look a little small for a salad bowl, but once you start cutting into this delicious cornucopia you realize it's going to be a while before you're a member of the clean-plate club. Believe me, this is a good thing.